Home › entertainment › Gwen Stefani Finds A Young Child Being Bullied - Now Watch When He Goes Onstage . 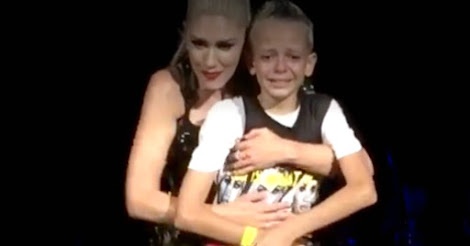 . .
Gwen Stefani Finds A Young Child Being Bullied - Now Watch When He Goes Onstage . . .
"About three years ago when things were hard in my life, I prayed to God every day that I could get a chance to use my gift that God gave me and make a difference in some way in this world." Those words were Gwen Stefani's prayer for the past three years. And after her most recent concert, they became words she will never forget. When Gwen Stefani looked out at the crowd, it was a certain hand written sign that caught her attention. A mother had written a sign with the message, "My son was bullied from first to fifth grade." As she continued reading, it seemed apparent that Gwen realized this night was going to be something special. She looked right at the little boy standing below her, and immediately yelled out, "Get up here right now!" The young man was lifted onto the stage with tears streaming down his face. As they embraced, the moment was absolutely beautiful. With a huge smile on her face, Gwen excitedly shared the message of zero tolerance for bullies, along with the words "Last night, this little guy was the answer to my prayers." The singer even shared a backstage selfie with Brandon. Brandon told local news that Gwen thanked him for listening to her music and added her autograph to the sign his mom wrote. 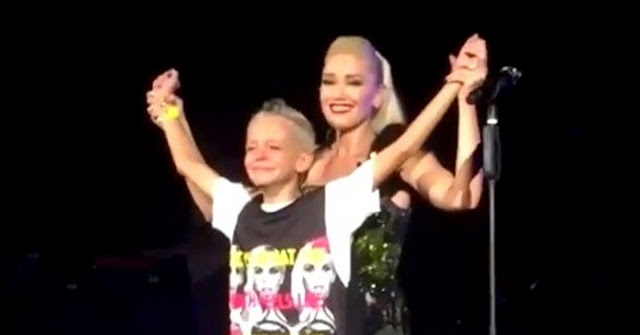 His mom Maria, who had promised to get him tickets to the front row of one of Gwen's shows, said of the singer, "She means a lot, and I wanted her to know that. From one mother to another." This isn't the first time Gwen has used her platform for a good cause. Last year she partnered with makeup brand Urban Decay for an initiative that seeks to empower women around the world.